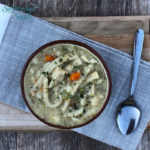 Grandma’s Instant Pot Chicken Noodle Soup Is the Perfect Delicious Dish for Chilly Days! We love easy soup recipes! 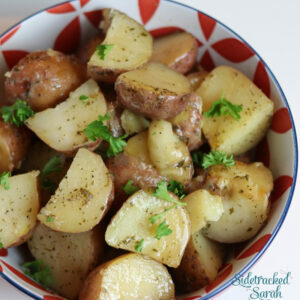 Some of our favorites include Instant Pot Italian Beef Stew and Slow Cooker Potatoes & Meatball Soup. Do you remember walking into your grandma’s kitchen when you were young? If your grandma was anything like mine, there was always something delicious bubbling away on the stove or in the oven. One of my favorites was grandma’s chicken noodle soup! Now, Grandma didn’t have an Instant Pot, but something tells me she would have put it to good use. I think this version is just as good as Grandma’s! It’s great for lunch or dinner, and a healing meal when you’re a bit under the weather. DOES THIS INSTANT POT CHICKEN NOODLE SOUP RECIPE HAVE TO SIMMER FOR A LONG TIME? Grandma’s Chicken Noodle Soup was amazing, but realistically? We don’t always have time to let it simmer away for ages. We still want that glorious chicken noodle soup flavor, juicy chicken, and tender veggies and noodles, though! This is all possible in just minutes with the Instant Pot. It’s so good, and so easy! WHAT SHOULD I SERVE WITH GRANDMA’S INSTANT POT CHICKEN NOODLE SOUP RECIPE? This soup is delicious as is, but you can also serve it with your favorite sandwich on the side or whip up some Southern Cornbread Muffins! 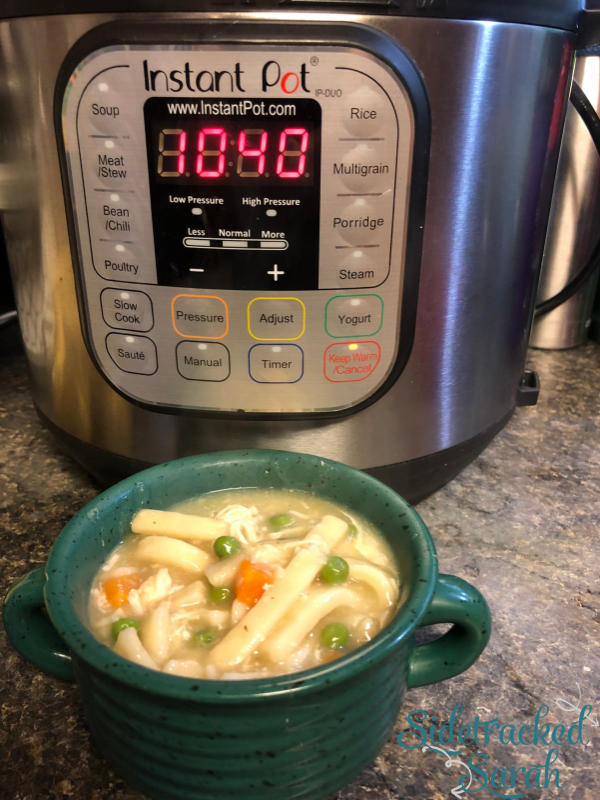 WILL GRANDMA’S INSTANT POT CHICKEN NOODLE SOUP RECIPE FREEZE WELL? You can freeze this soup, but I would recommend freezing it without the noodles if possible, as they tend to get a bit mushy during the freeze-thaw-reheat cycle. It keeps well in the refrigerator for a few days though, so you can have an easy lunch or dinner with the leftovers! WANT MORE EASY SOUP RECIPES? Place chicken breasts, chicken broth, onions, pepper and thyme in Instant Pot. Turn Instant Pot to Manual/Pressure Cook, high pressure and set it to 15 minutes for fresh chicken or 20 minutes for frozen chicken. Remove the chicken breasts and shred. Turn the Instant Pot to Saute. Add the frozen egg noodles. Add chicken back in. Cook for about 20 minutes on Saute. Add frozen veggies and 2 cans of cream of chicken soup. Stir and cook another 5 minutes or so. Taste test to make sure the noodles are cooked enough. Serve in bowls. We like to eat ours over mashed potatoes. Show me what you made on Instagram or Facebook and tag me at @sidetrackedsarah or hashtag it at #sidetrackedsarah.